Height: 91 cm / 36 in. Materials: papier-mache, foam plastic, foam rubber, wood, metal wire, fabric, down, silk threads, glass furniture. BLUE and RED DRAGONS are created, designed, and built by Nikolai Zykov in 2017. 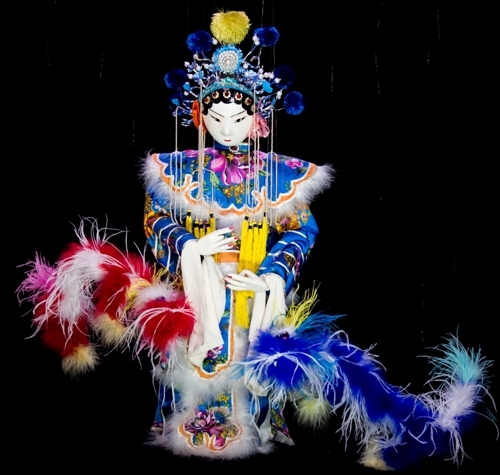 CHINESE BEAUTY - strings marionette in Beijing Opera costume with two hidden Dragon marionettes. The puppet is in a costume Guanijuang of Beijing Opera. Head dressing - Fynguan. See PHOTO ALBUM of CHINESE BEAUTY. Chinese beauty in TV show, Leningrad, USSR, 1990. Chinese beauty in film "Nikolai Zykov Theatre of marionettes", Moscow, Russia, 1993. Chinese beauty in TV show, Moscow, Russia, 1995.